Following a spectacular crash last August, the Australian Wot Rocket world speed record attempt is gathering speed again. 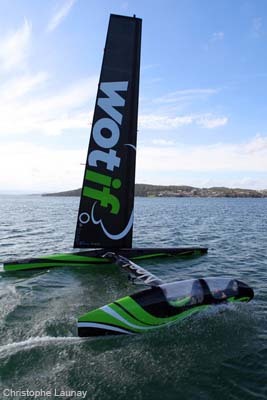 In the last six months the sailing community has seen: kite boarders twice break the 50 knot barrier over 500 metres; Vestas Sail Rocket start new record attempts in Namibia; and the Macquarie Innovation team – led by Simon Mckeon – claim (subject to ratification by the WRSSC) that it had become the first sailing vessel to break 50 knots ( READ STORY HERE ). The crash test from last August meant the team could take the opportunity to try out the latest round of modifications including a new closed hydraulic steerage system which controls the aft foil direct from the pilot’s control column. The new hydraulic cylinders mean the pilot can turn the rudder with ease and adjust the pitch of the foil by increments of half degrees. The new hydraulic system has added set up time but once the oil has bled the pilot can push a button and the controls respond like a flight simulator as opposed to the previous push/pull rod and cable system which flexed and lagged. The idea of an extension piece that jettisons off has been put to one side for now – the force it exerted on the wing sail was pushing the nose of the hull down. To bring the forces into alignment Wot Rocket’s wing size has been increased by 15% with a metre added to the top of the carbon fibre wing sail and a strip added along the trailing edge. A new Nexus instrument package has been installed including a wind wand on the leading edge of the wing sail that gathers data, which allows the co-pilot to trim to the apparent wind angle. “Rather than sailing like a sailor we are now flying like a pilot, and sticking with our numbers,” Langman continued.